Our Texas ranch was blessed by the Ogalalla aquifer. Anywhere we drilled to 400 feet, water was found. Windmills and electric pumps provided ample and cheap water. Those of you who read my scribbles know that my family relocated from Texas recently. One of the places we purchased was on a rural water system. This retreat is in an economically challenged area and shortly after closing, the water coop experienced a pump failure. The pump is at about 12,000 feet depth so it is high powered and expensive. The coop did not have reserve funds to replace the pump. Our place in the mountains was blessed with two ponds that never go dry and copious rainfall. I drilled a well about 800 feet in the rock. It was dry. We were still without a ready supply of potable water. One of the improvements I made to the property was a 6000 sq ft shop with metal roof and siding. I added Alcoa leaf relief (http://www.youtube.com/watch?v=InaJq1qgvmI) to the rain gutters of this building. Next I purchased two 3000 gallon potable water tanks (http://www.watertanks.com/products/0015-039.asp) and a supply of four and two inch Schedule 40 PVC pipe. The tank salesman inquired if I lived in the country. Affirmative I told him and he recommended a patch kit. There was an obvious linkage in his mind between the country and need for a patch kit. I inquired and was advised that kids in the country all have .22 rifles. They often hit the big tanks, hence the need for the patch kit. I ordered the kit, not because of any lack of responsibility but because the future is indeterminate. Next I dug out an area 8’x14’x2’ near where the rain gutter downspout was located and leveled the bottom, carefully removing any rocks. A ditch was dug from this area out over an embankment. The water tanks were positioned inside of the excavated area adjacent to one another. Freezing of the outflow is eliminated by placing it below the local frost line (18” depth). I don’t care if the top of the water freezes in the tank because it is designed to accommodate such expansion. I did want to make sure that I would have water during the cold winter months and didn’t want the outflow to freeze. The tank wasn’t buried deeper because I wanted as much elevation difference between source and point of use and wanted to minimize soil pressure on the plastic tank. The 4” PVC pipe was used to connect to the rain gutter downspout through an appropriate adapter and two 2” Ts were added (see photo). An L was cemented onto the bottom of this vertical run of 4” PVC pipe at the bottom of the excavated area and a section of 4” PVC was run horizontally in the ditch and connected to the L. A 4” PVC ball valve was affixed to the open end of the horizontal pipe. The purpose of this valve is to provide a diminished exit water flow so that the tanks will fill. When the tanks are filled this valve is opened all the way so there is no restriction to the rain water run off. The two 2” ball valves on the inlet are also closed when the tanks are full. This arrangement permits an automatic dump of the first rainwater runoff from the shop. Approximately 40 feet of 4” PVC pipe must fill (more with the leakage from the partially opened ball valve) before water is diverted to the tanks. This, in conjunction with the Alcoa leaf relief in the gutters, help minimize dirt and debris from entering the tanks. As you can see from the photos, the 4” PVC pipe rain downspout is bent 90 degrees before resuming vertical down into the ground and out over the embankment. This small horizontal section has two, 2” Ts connected to PVC ball valves feeding two inch PVC pipe into the blue green water tanks. Flexible rubber sections are used to connect the 2” PVC pipe to the top of the tanks. The tank will flex as it fills and empties. These rubber sleeves provide flexibility to accommodate this flexion and reduce strain on the PVC pipe and joints. Flexible rubber sleeves were also used to connect the bottom outflow of the water tanks to 2” PVC pipe. Each tank has its own ball valve shut off and a third valve can be used to shut off water flow to the house at the tanks. These valves are such that one can draw water from either tank or from both tanks. I plan to use one tank primarily with the other held in reserve so at no point should I have less than 3000 gallons of water. 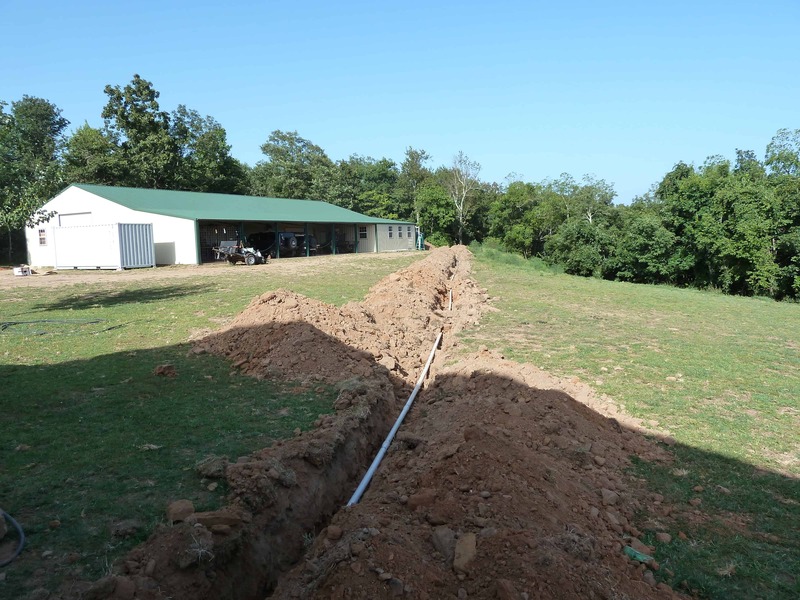 A ditch was dug from the excavated area to my house and 2” PVC pipe was laid. I had made friends with a ‘master blaster’ explosives demolition expert and he provided a core drill that was used to make a 2 ½ inch hole through the concrete foundation of the house into the basement. The PVC pipe was connected to a freeze proof hydrant and then to a 2” galvanized pipe that passed through the foundation. Silicone latex and tar was used around the pipe to prevent water from entering the basement. Small patching was done on the basement side of the penetration with hydraulic cement and a ball valve was installed inside at the penetration. The ditch was covered. As you can see from the photos several water filters are connected in series. These filters range from 80 to 5 microns (http://www.bigbrandwater.com/bigbrfi.html – for filters and housings). The large horizontal stainless device is from Minipur (http://www.ultraviolet.com/water/minipu01.htm ). It is a UV sterilization device sized for the water flow. It will kill all biologicals not removed by the filters (protozoa, bacteria, and virus). I purchased adapters from Minipur so that it will accept 120vac or 12vdc. I keep the 12vdc adapter in EMP protected storage. A bleach solution was used to ‘shock’ the full tanks and plumbing so that I started out with no active biologicals. The blue green tint to the tanks will supposedly prohibit algae formation. I plan on adding bleach from time to time to ensure nothing is growing in the tanks. Given the elevation differential between the water tanks and my house, gravity will provide pressure for the first floor toilets, bath, and kitchen and for basement toilet, bath, and shower. The gravity pressure is just enough for an older washing machine so we can even wash clothes. I plan to add a 12vdc pump and pressure tank so that the first floor shower and second floor bath and toilets will function. Of course I have solar cells and batteries sufficient for this tasking. While this project was being completed, the rural water district contracted with an adjacent district for water so I do have pressurized and treated water. As things worked out, I checked the dry well the other day and it had 200’ of water. Now I don’t know the recharge rate, which may be too small for my needs, but I plan on having it bailed in the future so that the recharge can be calculated. Of course we could have carried water from our ponds and filtered, but I suspect that would become tedious quite soon. This simple project was most satisfying. It is nice to have 6000 gallons of water recharged by the hand of God. Ample free water for home and garden. That looks like a very well engineered system you built there. I was wondering, when you decided to relocate, what were your deciding factors, and what were your biggest obstacles? You seem to be very knowledgeable about wells. Could you share anything you have learned about well drilling, location for well sites, etc. I recently acquired property in Tennessee and it has “city water” while being in the country. I would like to know more about putting in a well to augment or take over for my existing water supply and would be grateful for any light you could shed on any part of the process. Thanks. This reminds me I have to hookup my rain barrel. Of course now that winter is almost upon us and I will have to bring it, mind as well get it ready for next year. Thank you for sharing. A nice system and helpful suggestions. This is really great, and will probably harvest a lot more water than you would expect. It’s great to see a DIY project turn out results that are arguably better than a commercially available water solution. Thanks for sharing! I agree Brian – quite a system. Thanks all for your generous comments. It is hard to answer specific questions such as Karen’s properly in this format so if there is interest I shall try to do by a separate post. If you have a question that needs a more thorough answer, Rourke will probably be happy to forward it on directly to me. Before beginning such a rain harvesting project and especially before drilling a well, be sure to check on local restrictions and ordinances. The advantage to living in the real country is that there are none. After a couple of months rainfall, I now have more than 4000 gallons of water. Commercial water wells are often very very deep. The pump that died in my area will cost more than $100,000 to replace. Karen, having had several water wells drilled over the decades one learns little by little. I always like to drill my wells on the high ground. The pump has to work a little harder but oh the benefits. First, the well head will never flood and contaminate the water supply. Second, if using a windmill, there is more wind at the top of a hill. Third, having once raised the water to the surface, gravity can then be used to move the water where it then might be needed. Living in the flat Texas Panhandle taught me the need for a quality surveyor’s automatic level such as the Sokkia http://www.capitalsurveyingsupplies.com/Optical-Surveying-Levels-s/1844.htm), for determining where gravity would move water. The eyeball is really useless for determining slight grade differences. Water well drilling is an art and science. A qualified driller will begin by researching county water district history on wells in the area. That will give him some idea if water can be reached at a reasonable depth in your area and at what depth. I recommend you speak with at least three drillers and compare costs, especially for grouting and casing. For an uncased well (with the top 20′ cased and grouted as required by law in this state) drilling in the rock cost me $2.00/foot. Had we hit water initially, casing to depth and installing a pump and pipe would have raised the outlay considerably. If you have the wind, windmills are wonderful and you can put an electric pump below the windmill pump for use when becalmed. Due to the weight of the water column, hand pumps are really not useful beyond about 80′. Brad, your questions were addressed in a previous post that you can locate by clicking on Panhandle Rancher on the gray highlighted bar on the top left of this page and searching for WHY I LEFT TEXAS. My first choice for primary relocation was Wyoming with cheaper Idaho land second. Forest fires and mudslides have caused us to abandon our NW property for now and we live in a secondary location, also in the mountains. Meanwhile, our NW land appreciates in value and although the surface improvements may burn, the primary investment still appreciates. Thanks Panhandle Rancher. Appreciate your sharing.